Rough cut faceted emerald set in sterling silver filigree pendant. Emerald measures 19.5mm (13/16") x 15mm (9/16"). Pendant measures 48mm (1 7/8") x 26mm (1") including bale (41mm without). 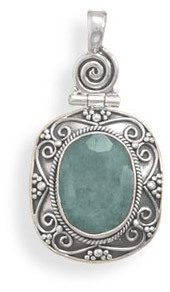 We guarantee our Rough-Cut Emerald Pendant in Sterling Silver to be high quality, authentic jewelry, as described above.